Following a lengthy legal battle, one of the most famous US presidential yachts, Sequoia is set to be sold to FE Partners for $0. 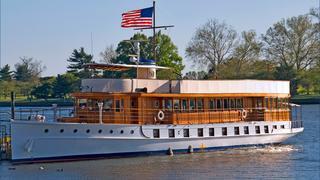 The Delaware Court of Chancery ruled on Monday (November 14) that the yacht was no longer worth the $7.8 million buyout sum that was stipulated when its current owners the Sequoia Presidential Yacht Group acquired the 32 metre yacht in 2000. The purchase was funded by a $7.5million loan from FE Partners, who now have the option to acquire Sequoia without making any additional payments. "_Sequoia _is sitting on an inadequate cradle on an undersized marine railway in a moribund boatyard on the western shore of the Chesapeake, deteriorating and, lately, home to raccoons," Judge Sam Glasscock explained. If properly restored, she could be worth up to $13million, industry expert Earl McMillen III told the Georgetown Chancery Court on May 11. 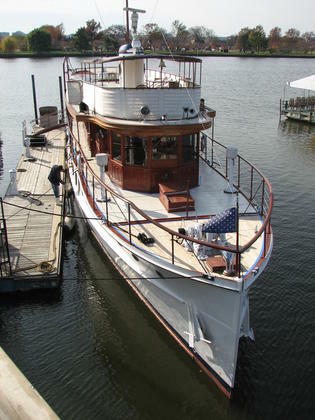 Built in 1925, this 31.7 metre Trumpy motor yacht served as the official US presidential yacht from 1969 until 1977, when Jimmy Carter had her sold at auction for $286,000. Her history is closely entwined with some of the most prominent US presidents of the 20th century — Herbert Hoover used USS Sequoia to visit his mother in Florida, while Franklin D. Roosevelt had a wheelchair lift installed so that he could use her as an operational base during World War II. Richard Nixon was particularly fond of USS Sequioa, taking more than 80 trips on board, including one shortly before he decided to resign in 1974. In recent years, Sequoia was made available for charter in Washington, D.C. But the yacht was hauled out at the Chesapeake Boat Works shipyard in Deltaville, Virginia in December 2014, where she has remained ever since. The Court of Chancery ruling brings this iconic yacht one step closer to returning to the high seas.